i am trying to do an entire fresh reinstallation of windows 7 on my self-built computer. 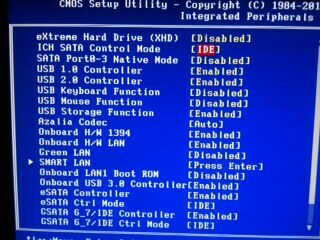 i am changing the boot order to CD/DVD first, HDD second. i am also manually selecting CD from the boot menu and it just refuses to boot from a CD. Last edited by linguini; 12-24-2011 at 04:49 PM. Which drive type is your optical drive, Sata? Pata? Do you have AHCI enabled in your bios? Last edited by profJim; 12-24-2011 at 05:39 PM. Is it a pressed DVD or did you burn it yourself? the drive is SATA and i have no idea what AHCI means. how do i check if AHCI is enabled? i guess its a pressed DVD. the DVD is authentic and i didnt burn it myself. It would be a option in the bios that you set the intel sata controller to 1 of 3 options, either raid, ide, or ahci. Try setting setting the controller to ide or try plugging the dvd into the gsata ports on the motherboard. Last edited by linguini; 12-25-2011 at 06:08 AM. Last edited by linguini; 12-25-2011 at 06:17 AM. i think you have to select dvd or cd rom device or drive when you press f12 at splash screen,are you doing that?